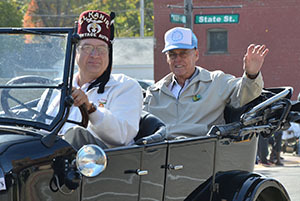 Longtime Iowa coach, educator and administrator Howard Vernon '57 served as UIU's Homecoming grand marshal Saturday, Oct. 10. Vernon’s teaching career began at West Central High School in Maynard, where he was also the athletic director and football coach from 1957-1962. His football team won the Upper Iowa Conference Championship in 1961. From 1962 to 1973 he served Waterloo East High School in various capacities, including teacher, football coach, vice president and principal. While at East High, Vernon began the longest football winning streak in Iowa with 57 consecutive wins. From 1966-1968 Vernon’s teams were the state champions. Along with his duties at East High, in 1965 Vernon’s team established the adult night school for high school credit in the Waterloo Community School System and served as the principal until it merged with the Area VII School. Vernon was honored in 1967 by the Des Moines Register as the Iowa High School Football Coach of the Year. He was inducted into the Waterloo Sports of Sorts Hall of Fame in 1970 and two years later he was inducted into the Iowa Football Coaches Hall of Fame. From 1973-1979 Vernon was associated with the University of Iowa as the offensive coordinator of Hawkeye football, sports school director and college relations outreach specialist, and assistant director of the University of Iowa Foundation for athletic fund raising. UIU’s oldest living alumnus, 110-year-old Emma Hough ’26 was also a special guest and saluted along the parade route by the UIU community. Currently residing in Sumner, Hough was active in campus life during her time as an Upper Iowa student. A member of Sigma Tau Delta, the Biology Club, Aonia, YWCA, WAA, and PEACOCK yearbook, she was the winner of the campus tennis tournament her sophomore year. The honor led to Hough being named the head women’s tennis coach during her final two years of college.